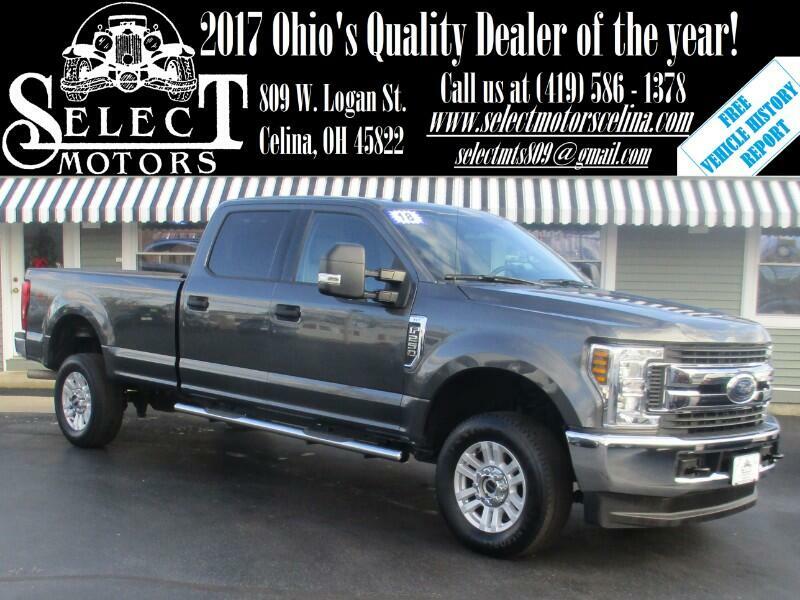 ***TXT US @: (419) 362 - 6200*** Running Boards included, 6.2L V8, 4x4, Backup camera, towing package, automatic headlights, compass, outside temperature, heated/signal mirrors, A/C, power windows/locks/mirrors, keyless entry, AM/FM/MP3, auxiliary and USB port, steering wheel mounted, Bluetooth, tilt and telescopic steering wheel, cruise control, information center, 18" alloy wheels. After last year's full redesign, not much changes for the 2018 F-250. There's a new Limited trim, which is the F-250's new top trim level, and a few minor changes to standard and optional feature equipment. The 2018 Ford F-250 Super Duty is a full-size, heavy-duty pickup available in six trim levels: XL, XLT, Lariat, King Ranch, Platinum, and Limited. It can be configured as a regular cab, an extended cab (aka SuperCab) or a crew cab with either a 6.8- or a 8.2-foot bed. A 6.2-liter gasoline V8 produces 385 horsepower and 430 pound-feet of torque, and an available turbocharged 6.7-liter diesel V8 puts out an impressive 450 hp and 935 lb-ft of torque. Both engines are mated to six-speed automatic transmissions to drive the rear wheels, though four-wheel drive is offered as an option. Base XL models come standard with features that include 17-inch steel wheels, manual front locking hubs (four-wheel-drive models), intermittent wipers, a rearview camera, manually adjustable telescoping towing mirrors, a removable locking tailgate with tailgate lift assist, a 2.5-inch trailer hitch receiver with a 2-inch insert. Also included: air conditioning, vinyl upholstery, manual windows and door locks, a tilt-and-telescoping steering wheel, a driver information display, and a four-speaker audio system. Extended- and crew-cab models get a six-speaker system. Step up to the XLT and you get 18-inch alloy wheels, power side mirrors, manually telescoping and power-adjustable heated mirrors with built-in turn signals, four locking cleats in the bed, keyless entry, cloth upholstery, rear under-seat lockable storage, power windows and locks, and rear privacy glass (extended- and crew-cab models only). The XLT also includes cruise control, an alarm system, the Sync voice-controlled infotainment system, a 4.2-inch display, a USB port, and a CD player and satellite radio.